With the World Cup drawing to a close this past Sunday, we took some time to capture our favourite tweets from the knockout rounds. 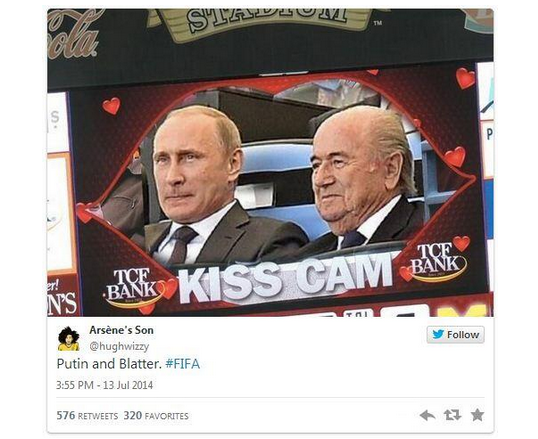 If you missed our favourite tweets from the group stage, you can check them out here. These tweets, from writers, celebrities and fans, often capture the events on and off the pitch as they occur in a unique lens and are of course completely uncensored. If you come across any gems that we've missed, feel free to copy them into the comments below. Ochoa is great in this World Cup, but I preferred him as the love interest in Good Will Hunting. James!!!!!!!!! #LosCafeteros !!!!!! DEMONIC skill that a dozen exorcists could`t get rid of……Magesteeeeeeeeeeeeeeeeeeeeeeerial !!!! David Moyes has just sat back on his sofa and declared "This is much more like it" about the Costa Rica v Greece game. New American fans: this is what soccer is like. It kills you, and you die, and sometimes it's beautiful, and then you do it again next week. This is the #Germany we were all expecting….looking sharper than a porcupines backside today. This is the World Cup's red wedding. Spoiler Alert! I wrote the script for this World Cup game. Alexis Sanchez : "I am delighted to join Arsenal, it's a great feeling . Looking forward for 4th place and then joining Manchester City." Admitting your watching the World Cup 3rd place play off is like confessing to having seen a Transformers DVD with director's commentary. If I was the Brazil boss, I'd plunge my finger into my own arse, then put it under the nose of each player. It's the only way they'll learn. If I was Scolari, I’d just slip out now while everyone’s watching the replay.